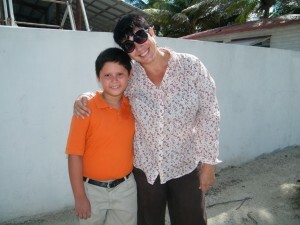 Be Kind Belize on May 24th announced the winner of the first ever Kindest Kid San Pedro Award. The announcement and presentation of awards were done during a well attended Youth Rally at the Rafael Angel Nunez at the San Pedro High School. The first place award winner is Mariano Calderon of Island Academy. Second place was awarded to Faith Azueta from San Pedro Roman Catholic School while the Be Kind Belize Choice Award went to Naomi King from Island Academy. According to Colette Kase of Be Kind Belize, the idea of the Kindest Kid San Pedro Award was for the schools and community to recognize and award students that are exceptionally kind. “We hope that the community can take notice and that other children can take them as a role model and for them to find out that kindness is not something that they should avoid but something they should embrace,” said Kase. It is the hope of the organizer that through the award program, which she hopes will be done annually, children will be able to be more kind to their friends, family, animals, the environment and to the community and for them to understand how important it is to be kind. Mariano explained to The San Pedro Sun that it is an honor for him to have won the Kindest Kind San Pedro Award. “The kindness thing for me is that I always give my chances up when it is my turn. I always go and buy for my friends. If I have something, my friends will not leave without anything and they will also get as well,” said Mariano who encouraged other children to be kind. The first place winner got certificate, $400 in cash, a $25 starting bank account and a trip for four at Bacab Eco Park. Second place winner also received a certificate, $200 in cash, $25 starting bank account, and the Be Kind Belize Choice Award winner got a certificate and $200 in cash. In addition, all three got many other prizes including books, dinners and chocolate. Be Kind Belize would like to thank everyone who made the Kindest Kid San Pedro Award initiative a success. The San Pedro Sun joins the community in congratulating all three kids for being exceptionally kind, and we encourage everyone around us to take initiative and show kindness in everything we do.